When it’s 98 degrees out and I have no air conditioning in my apartment, office, or car, the last thing I want is hot food. So I thought it would be the perfect opportunity to make ceviche, which I’ve been wanting to experiment with for a while. I decided to go with a shrimp variety, just because I didn’t feel like journeying all the way to the really nice fish market to get something extra fresh, like red snapper, sea bass, or scallops, which wouldn’t be cooked first. 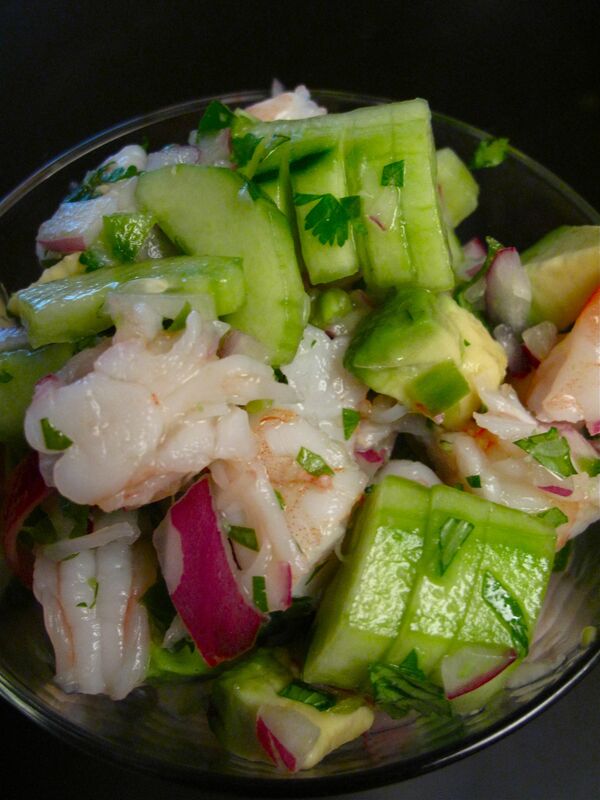 The issue with ceviche is that the the fruit juice “cooks” the fish with acid, but doesn’t kill bacteria, so the fish has to be sushi-quality fresh. With shrimp though, you can flash boil it and then toss it in ice water before marinating it in juices. boiled them in a large pot with two tablespoons of salt for just about one minute until they turned pink, and then quickly put them in a bowl of ice water to stop the cooking process. I then chopped them into smaller pieces an marinated them in the refrigerator (using a glass bowl, not metal) in the juice of six limes and two lemons for half an hour. Then I added a cup of finely chopped red onion and two minced jalapeno peppers (serrano would be even better, but I couldn’t find one that day) and marinated for an additional half hour. Right before serving, I tossed in a cup of fresh chopped cilantro, a diced cucumber, and chunks of avocado. While delicious, it needed a bit of a sweet kick. Next time I will definitely add a bit of orange juice to the marinade, and maybe some diced mango! Also, this was enough for two main course servings and two full days of leftovers, so if you’re just going for appetizer sizes, cut the recipe in half unless it’s a big crowd. This entry was posted in Cooking adventures and tagged shrimp, summer. Bookmark the permalink.